Peddler’s Village in Lahaska will present Spring KidsFest, a free event geared towards families and young visitors, on April 27 and 28. The weekend includes traditional kids’ activities, educational opportunities, and hands-on experiences. 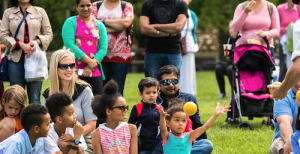 Rain or shine, the festival take place on Saturday and Sunday from 11 a.m. to 5 p.m. Peddler’s Village shops will be open until 8 p.m. on Saturday, and admission and parking are free. The entertainment lineup for the weekend includes live music, story times, animal presentations, crafts, face painting, balloon artistry, moon bounces, and police cars and fire trucks. Community-based nonprofit organizations including Project SEARCH and Bucks County Audubon Society at Honey Hollow will also be represented. The American Red Cross will host a blood drive on Sunday, April 28. Three Moonbounces open from 11 a.m.–4 p.m. The KidsFest Fun area will feature bounce houses, hands-on police cars and fire trucks, crafts, face painting, balloon artistry, Bootlegger Bo’s Gem Mine, and more. Community-based nonprofit organizations including Project SEARCH and Bucks County Audubon Society at Honey Hollow will also be represented. The American Red Cross will host a blood drive on Sunday, April 28 from 10 a.m. to 3 p.m.
A 1/2-mile Family Fun Walk through the Village on both Saturday and Sunday morning, The cost is $10 per person, with proceeds benefitting local charities. Children 12 and under also receive an unlimited bounce house wristband, a free craft, a carousel ride at Giggleberry Fair, and a Giggleberry Fair Activity Pass. Registration is at 8:30 a.m., stretch time is at 9 a.m., and the walk is from 9:30 to 11 a.m.